Ultron measures in right around 6 1/2 inches, so he's pretty much exactly the same size as most other Marvel Legends figures. I'll go on record and admit that I'm not too well versed in Marvel lore (that's Brad's area) so I'm not sure if this Ultron is based off of any specific appearance or if he's appropriately scaled to other characters. He definitely looks like the comic versions of him I have seen and not an imagined "film universe" version of the character. He has all of the classic attributes of the character on the head, but the body looks a bit more modern. He's a robotic looking baddie (created by Hank Pym, I know that much) and fits in pretty well with the rest of the newer Hasbro Marvel Legends as he has that very smooth, toyish look that many of the newer figures share. 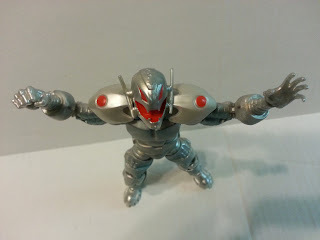 Ultron has a fair share of articulation: ball jointed ankles, double hinged knees, swivel thighs, ball jointed hips, a swivel waist, abdominal hinge, hinged shoulder pads, ball jointed shoulders, swivel biceps, double hinged elbows, ball jointed wrists, a hinged neck, and a ball jointed head. That's a very good amount of articulation. I just don't like a lot of it. OK, let me start with a positive. The head and neck articulation is awesome. You can actually make Ultron look straight up and down, which is always useful for realistic flying poses (something Mattel seems unable to do despite the dozens of Superman figures they've released). All of the joints are nice and tight and nothing feels like it's going to break. Since he's a robot, the joints aren't overly noticeable; joints like the ab hinge and wrist joints are even nicely hidden. I guess the two biggest problems I have with Ultron's articulation are 1) the double hinged knees and elbows are frustrating to maneuver and look bizarre when extended and 2) I despite the ball jointed thighs that Hasbro uses on their Marvel Legends figures. Those joints are just always so tight and frustrating to maneuver that I never feel like I can get the figure in a pose that I'm fully happy with. If you've never had problems with Marvel Legends' legs, you'll be fine. Other than that issue, Ultron has some nice expressive articulation. The look of the figure seems to be a blend of the character's classic look and some more modern incarnations. 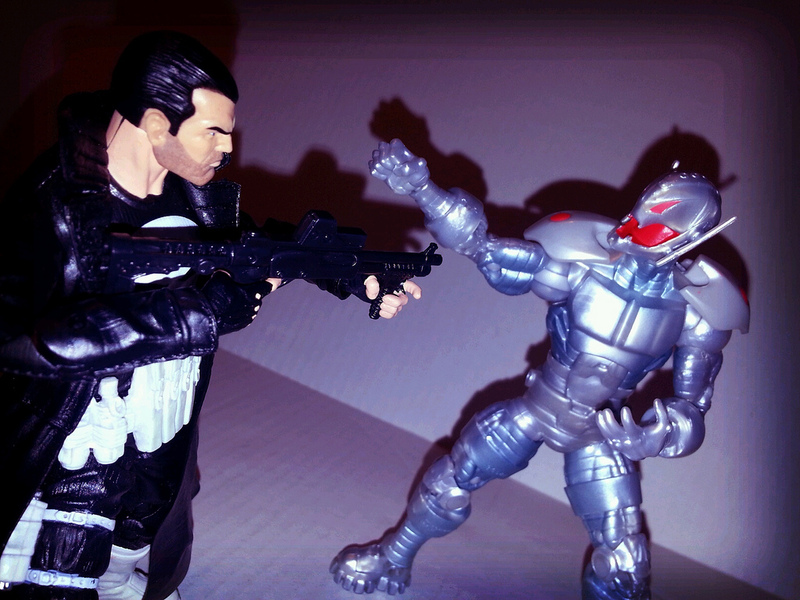 The head is probably what most fans will judge him by, and I think Ultron looks alright. He has a really crazy gaping mouth, angular eyes, and some antennae that run down the sides of his head. (He kind of reminds me of the Sigma 6 Ninja Bat, although Ultron was created first, so I guess the Ninja Bat reminds me of Ultron now.) There are a few very soft and minor details on the head. The body sculpt is pretty nice and looks like it should fit in well with an Iron Man line. While he's one of the Avenger's primary baddies, an armored or robotic foe just makes sense as a good adversary for Iron Man to go toe to toe with. He's covered with bands of armor and had large cuffs where his boots and gloves would be. I really like the sculpted chest that mimics human musculature and the visible spine on his back. When characters don't carry weapons hand sculpts are always important, so I like that Hasbro chose to give Ultron two different hands. His left hand is sculpted open with fingers splayed out and his right hand is sculpted in a fist. There's even some smaller jets of some kind on the bottoms of his boots (although no peg holes, FYI). 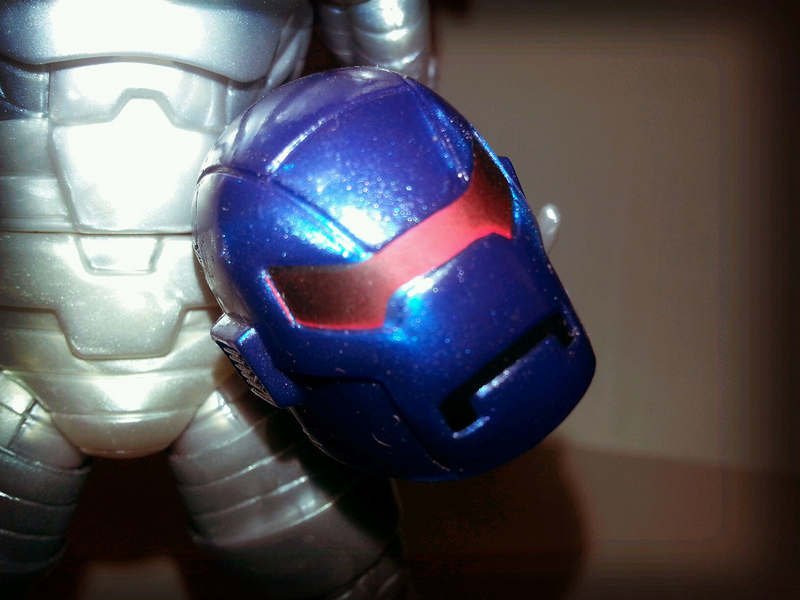 While Ultron is a great sculpt, his paint work suffers. Actually, there's very little paint work here. The eyes and mouth are neat and clean and each of his shoulder pads has a bright red dot, although my left shoulder pad's dot is a bit off center. The rest of the figure seems to be simply molded in a pearlescent gray plastic that has a little bit of a silver sheen to it. There is a nice blue wash on the inner legs, arms, and on the torso, which gives the figure a funky, silver age look, but otherwise it's simply the gray plastic. I do wish that Hasbro had either molded him in a darker or more metallic color, as this looks far too toyish (and yes, I realize I am complaining about a toy looking like a toy) but it also gives the figure a "swirly" look. That's hard to explain, so take a close look at some of the pictures. This is probably the biggest complaint I have with this figure. 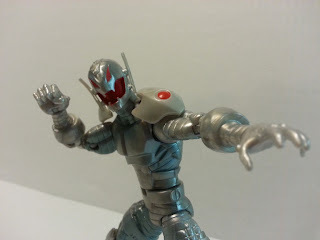 I was looking at some other Ultron figures that have been made by various companies (Toy Biz, Diamond Select) and they all nail the metallic nature of the character better than Hasbro did here. It's a shame. Ultron doesn't have any accessories, but he does come with a piece of the Iron Monger build-a-figure that I mentioned at the beginning. Ultron comes with Iron Monger's head. It's blue (this is the comic version of Iron Monger, not the movie version) and molded in a pearlescent blue plastic that also gives it a weird swirly look. It's hard to judge the Iron Monger by just this piece, but I will say that the sculpt looks nice and the head looks to be about twice the size of a standard Marvel Legends figure. 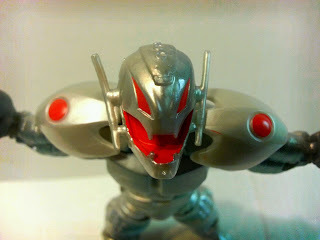 Overall, I found Ultron to be disappointing, especially when I looked at some pictures of the awesome Ultron released last year by Diamond Select Toys as part of their Marvel Select line. The sculpt is decent but the articulation is a mixed bag and the paintwork really leaves a lot to be desired. I'm hoping that the Iron Man and Iron Patriot figures fare better. While it's cool that Hasbro put Ultron in this line, why no Mandarin in this lineup? You know, the Mandarin- Iron Man's arch enemy who is appearing in the new blockbuster film Iron Man 3 that's title is plastered on the packaging of the film? Despite the way the movie treats the character (no spoilers here) it would seem logical that the company with the Iron Man 3 toy license would want to release a figure of the main villain. Overall, I'm disappointed to give the figure an "Eh and a half." If you really want the build-a-figure, are a Marvel Legends completist, or just really love the character, go for it. 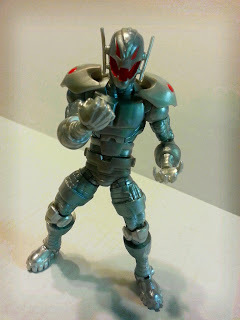 Otherwise, I'd recommend the Marvel Select Ultron, as he looks to be both a much better display piece and toy. The package proclaims that "Hank Pym's crazed creation will stop at nothing to conquer all mankind!" Barbecue17 will stop at nothing to review action figures. Check out his Flickr page to see what he's working on (or not working on) currently. I own several Ultron figures - the Marvel Universe and Diamond Select one, to name a few - and I can honestly say that I love this figure as well. No disappointment whatsoever...it's a great mix of his classic look with a modern twist and the articulation is superb (yeah, not wild about those ball-joined hips either, but otherwise it's all good). The lack of paint can be a bit odd at first, but it works, and I really dig the "swirly" look you mentioned. and that head sculpt? Perfection. Overall a great figure.